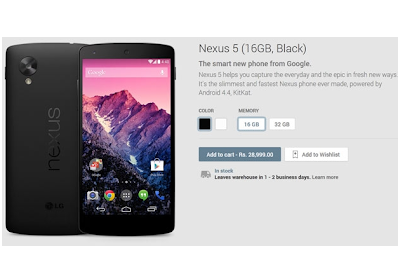 The Nexus 5 is now available for purchase on the Google Play Store in India. The phone comes in two colours - black and white. The website mentions the estimated delivery time (in India) as 2-7 business days. The 16GB model of Nexus 5 sells for Rs 28,999 while the 32GB model costs Rs 32,999. The Wi-Fi version of Nexus 7 costs Rs 20,999 for the unit with 16GB internal stoarge and Rs 23,999 for the unit with 32GB internal storage. The 32GB unit of Nexus 7 is also available with support for LTE (cellular data connection). The LTE version costs Rs 27,999. Nexus 5 will also go on sale in retail stores across India from today. However, in retail stores the device has been priced at Rs 29,999 for 16GB model and Rs 33,999 for 32GB model. The price is Rs 1,000 higher because of added retail-related costs. To buy from Play store, a consumer has to use a credit card registered with the Google Play store. 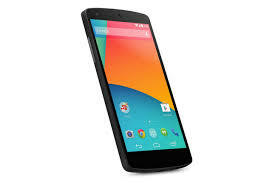 The two models of Nexus 5 and Nexus 7 (32GB) will ship immediately. the Nexus 7 (16GB) will ship after November 26. With a 5" display, Nexus 5 gives you a Full HD display so you can see every detail in lifelike color with less glare and a wider viewing angle—the perfect canvas for your moments. Powered by Android 4.4, KitKat, Nexus 5 is fast and powerful.